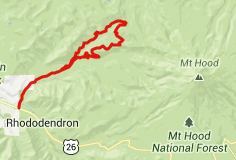 Lolo Pass, perfectly situated on a flank of Mount Hood, is only paved on the south side. I learned this fact when looking for a way back down the north on my road bike. But actually there is another way back down, arguably even more attractive than the East Lolo Pass road. It goes over a slightly higher summit on FR1528. That is the subject of this page. From South. The ride up East Lolo Pass road is described on the Lolo Pass page. On top of the pass there is only one way to continue on pavement. FR1828 descends ever so slightly and then gradually climbs to a higher altitude on the forested slopes of lower Mount Hood. From South. This road has lots of sloughs and can be pretty rough with other surprising, never-before-seen pavement features. Climbing this side may be better than descending with delicate tires or wheels. This road is on the other side of the valley, directly across from the southern approach. There are two points where Mount Hood becomes visible, first at the junction with the road continuing on to Top Spur Trailhead, and another one a little later. In a way this road is the best of two worlds. It's the thick, impenetrable tunnel through the forest road, that is typical for Oregon, but it also has a few far views. But it does not have the old growth forest patches, that are typical of summits closer to the coast. The road joins the Lost Creek access road where it crosses a creek (labeled as Muddy Fork Rd on my de Lorme Gazeteer). Shortly after that it joins back to the southern approach.